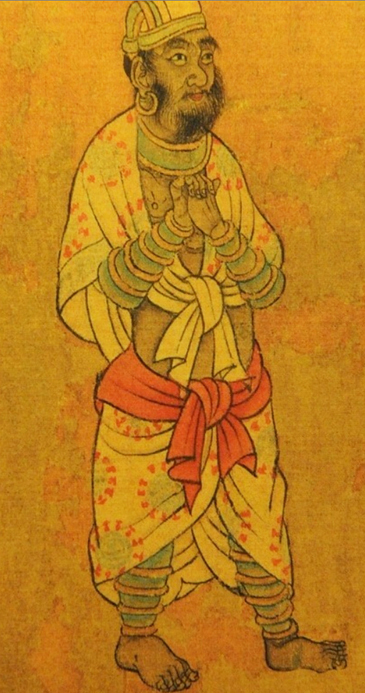 Dangyeomlipbonwanghoedo (唐閻立本王會圖), repainted one of Yangjikgongdo (梁職貢圖) of China's Liang Dynasty (梁朝: 502–587). The ancient work of art depicts 24 emissaries sent from 24 countries to pay a tribute to the Chinese emperor. Scores of countries were under the political influence of China including three ancients kings of Korea: Koguryo, Baekje, and Shilla. What is interesting about the painting is the bare-footed Japanese emissary in poor attire. In ancient times Japan was backward country compared with its neighboring China and Korea. Korean people and it culture became backbone of ancient Japan and Japanese culture. Almost all advanced culture were introduced by Koreans to ancient Japan including Confucianism and Buddhism. In particular, ancient Japanese tried to copy the much advanced culture of Baeje, one of Three Kingdoms on the Korean Peninsula. They revered Baeje, calling it "Big Country."